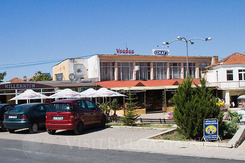 Location: Chernomorets is a little quiet Black Sea resort, beautifully situated at the Bulgarian southern seaside. It is artistically spotted on the lovely peninsula, in the bay of Bourgas. The town is located just 23 km south from Bourgas, and 8 km away from the famous ancient old town of Sozopol and Duni resort. History: It has rich history, dating back to ancient times, when Chernomorets used to be called St. Nicola. 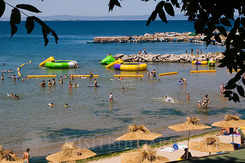 In close vicinity to the town, “The Garden”, “The Golden Fish” and “Chernomorets” camping sites are situated. The beaches are well hidden from the wind between rocky ravine, overgrown with nice bushes and young trees. All of the beaches are suitable for bathing, sun- bathing, and offer a lot of fun and entertainment. Beaches: The sea resort has four nice sandy beaches, each of them charming and specific for its own characteristics. If you want to escape from the crowded beaches, you will be definitely satisfied with the clean and peaceful beaches of Chernomorets. If you are the adventurous type of person, you will not be disappointed either, because Chernomorets is the perfect place for surfing and other water sports. The unique King’s Beach, which spreads out to the south is suitable for water- skiing, fishing, water- jumping, sea trips, and even nudism. From May till September the average temperature of the water is about 22 degrees Celsius, which makes it good for bathing until late October. At the same time the summer heat is easily endured, because of the fresh sea breeze. Dining & Entertainment: Chernomorets offers plenty of places for accommodation and entertainment- modern houses and villa sites, small hotels, cozy cafes and restaurants for your perfect holiday. Most of the restaurants are situated at the sea coast and have romantic panoramic view, revealing the last sun- rays, gently caressing the rocks. Other good restaurants and cafes that deserve special attention are those, located on the Trades’ Street. The street is checkered with traditional taverns, bringing special atmosphere to the town. The local restaurants offer a variety of show- programs, selected drinks, and delicious meals, prepared by real master chefs. There are two clubs, bringing fresh colour to the town nightlife in Chernomorets. They work from 10.30 pm till dawn. 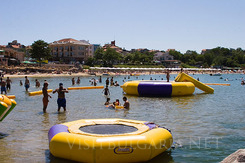 One of the clubs is situated at the central beach and organizes great summer parties. In short- a vacation in Chernomorets will definitely make you feel relaxed and full of energy, so that you get ready for the next lovely holiday at the Bulgarian seaside.